* Supports Celeron (PPGA) and Pentium III. * Support 66/100/133 MHz Front Side Bus frequency. * Supports two 8/16/32/64/128/256 MB DIMM module sockets. * Supports Synchronous DRAM (3.3V). 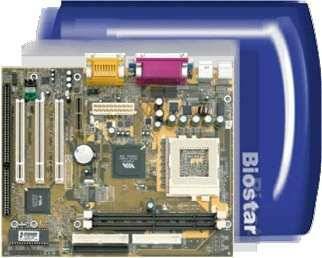 * Supports up to 512 MB with SDRAM. * Provide one AMR, three PCI and one ISA slots. * One serial port, 16550 UART with 16 byte FIFO. * UART data rates up to 1.5Mbaud. * One Infrared Transmission (IR) port. * One Floppy disk drives. *Two back panel USB and 2 front panel USB (optional). * Supports four IDE hard disk drives. PIO Mode 4, Master Mode, and high performance hard disk drives. * Supports Ultra DMA 33, Ultra DMA66 Bus Master Modes. * Supports high capacity hard disk drives. * Intelligent request for maximum AGP bus utilization. * 64-bit single cycle 2D/3D graphic engine. * Dual full-duplex Direct Sound channels between system memory and AC97 link. * 32 byte FIFO each direct sound channel.